In 1978, Italian-American author Mario Puzo, best known for writing The Godfather, penned the novel Fools Die. Set in a murky world of gambling, publishing and the film industry, it centres around the fictional Hotel Xanadu, Las Vegas. In the story, the casino management pumped oxygen into the gaming rooms, to keep people awake and gambling for longer. And, inevitably, over the years, as so often happens, fiction blurred with reality, and a myth was born. But, don’t worry, casinos don’t really pump extra oxygen into their rooms! In fact, if an establishment did try this (in any developed country at least), they’d be heavily fined and most likely shut down very quickly. With so many electrical items, not to mention possible smokers, an unnaturally oxygen rich atmosphere would soon cause fires! There are, however, a few less insidious tricks that casinos really do use to keep customers playing longer. Have you ever noticed how there are no windows or clocks at casinos? That’s so that you can’t see it getting dark and lose track of time! And, obviously, the alcoholic drinks – to make you loosen up and take bigger risks. This is one of the reasons you’re better off playing at online casinos, like EnergyCasino – where you’re always in complete control of your environment. Many people assume that card counting in blackjack is illegal, or at very least ‘cheating.’ But in reality, card counting is straight-up legal, and considered to be a perfectly valid strategy by many players. Of course, to be successful at card counting, you’ve got to be pretty smart; firstly, to keep on top of the maths, and secondly, to do it without the casino staff noticing. Because, though it’s technically legal, many casinos, quite understandably, make it against their own house rules – and will ask players caught counting to leave! Just ask Hollywood A-Lister Ben Affleck, who was famously less than subtle, resulting in his banning from the Hard Rock Casino, Las Vegas, in 2014. The human brain has a tendency to impose patterns… on everything! Now, in terms of civilization in general, this has been pretty beneficial, with people creating order from chaos. But, it also causes all kinds of funny side effects. One of these is that gamblers in casinos frequently judge particular tables to be ‘hot’ or ‘cold’, or ‘good’ or ‘bad’. Now, it is absolutely certain that every time cards are dealt, dice are rolled, or wheels are spun, that event is at the mercy of chance alone – but, due to the inevitable perception of ‘streaks’ in the random distribution of chance events – the human brain can’t help but think it is seeing patterns! Next time you’re playing, try an experiment – attempt not to see results as patterns, not to feel a streak or tendency is happening – it is so difficult because it goes against the way our brains are wired! Still, it can be fun to go with the flow! Though slot machines are now intimately associated with casinos, they didn’t start out in gambling houses. Nope, American mechanic Charles Fey built the first slot machine, known as the ‘Liberty Bell’ (hence the bell symbol on modern fruit machines), in 1895 for his customers to play whilst they waited in his auto shop. To cut a long story short, the machines went through several improvements and started appearing in places like barber shops and drug stores. Interestingly, in the early years they didn’t give cash winnings, but tokens for things from the particular shops, or even chewing gum (courtesy of a machine built by the Bell Fruit Gum Company). In fact, the flavours of the chewing gum they dispensed are the reason for the classic fruit machine symbols – like cherry and lemons! And, the ‘BAR’ symbol – well, that derives from an original symbol that was shaped like the bars of chewing gum! 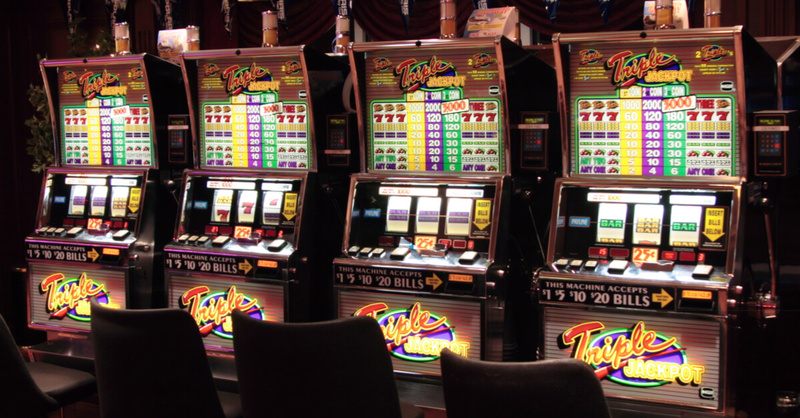 So, how did slot machines end up in casinos? The same reason they ended up in shops – to keep customers entertained while they waited – in this case, for space at the gaming tables. We wonder what Mr Fey would think if he could see how his humble ‘Liberty Bell’ started a phenomenon that would be a cultural icon and a central part of the global gambling industry! People often believe that if they strike it rich at a Vegas Strip casino they’ll be treated like royalty, with free drinks, meals and rooms, and that they’ll be invited back and join some special ‘big winners only’ club. But, think about it… the last thing those huge casinos want is big winners. Nope, whilst any legitimate casino has to pay out genuine winnings by law, its super easy for a less than squeaky clean land-based casino to ‘discourage’ big winners from returning, because they control everything about the physical environment – often down to that winner’s accommodation, meals and transport! Again, this is why it is so important to make sure you only play at casinos with great reputations, like EnergyCasino – and, in practice, its far easier to gauge the reputation of an online casino than land-based establishments. Just some food for thought.